Laser makers increasingly are turning to the medical device industry for innovation – but don’t discount other interesting applications on the horizon. The past year has been a tumultuous one for makers and users of lasers. A global economic situation that at best could be considered in the doldrums tempered expectations of breakout years for companies such as Newport and Coherent. Nonetheless, laser makers have had generally fine years because manufacturing, especially in the US, has begun to pick up – and lasers are the go-to systems for manufacturing everything from LEDs to automobiles to the latest, greatest personal electronic devices everyone must have. The main area, however, in which laser technology continues to thrive – and promises to thrive for years to come – is in medical technology. Many medical devices, of course, must be made with a level of precision that only lasers can achieve, but lasers that emit a variety of wavelengths increasingly are being used to treat patients directly, whether to eliminate cancerous tumors, heal wounds or slim people’s profiles. Lasers have not been perfected for most clinical operations, but they are steadily gaining ground. A recent study published in the Archives of Dermatology, for example, showed that laser treatment of varicose veins is not nearly as effective as traditional surgery (involving removal of the offending veins entirely) but is less invasive and often less expensive. In a multitude of clinics, especially in the US and throughout Europe, lasers are being used to transform the human body. Nothing is left untouched; the short list includes retinas, waists and hips, thighs and calves, scalps and forearms. Via recent progress in femtosecond-pulse lasers, vision is improvable and body shapes are imminently sculptable. One area picking up marketing steam is laser-based cataract surgery. Cataracts, which are lenses so deteriorated that they cloud over and become yellowed, are responsible for nearly half of all cases of blindness. More than 18 million people are blinded by age-related cataracts (and children can suffer from congenital forms of cataracts as well), and millions more have had their eyesight reduced by severe myopia or loss of color sensitivity because of the condition. OptiMedica’s Catalys laser system facilitates a smooth incision into the lens capsule, making cataract removal easy and safe for the patient. Courtesy of BusinessWire. Standard cataract care has involved surgical removal of the affected lens, which traditionally has been performed with a finely sharpened scalpel. Lasers, of course, can cut much finer lines than a metal edge, no matter how keenly made, and laser surgery has become sought after because results are better and recovery time for patients is quicker. 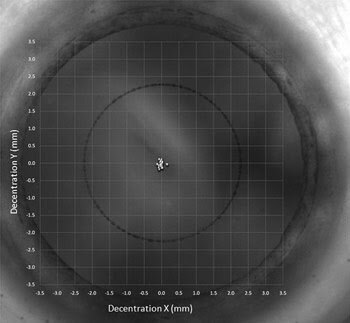 Several companies have been actively pursuing laser technologies suitable for use in cataract surgery, including Technolas Perfect Vision GmbH in Munich, Germany; Alcon Laboratories Inc. in Fort Worth, Texas; LensAR Inc. in Orlando, Fla.; and OptiMedica Corp. in Santa Clara, Calif. Each company has a system on the market for performing the precise retinal incisions necessary for removing cataracts and inserting replacement lenses as needed. Most are used in combination with optical coherence tomography systems that help surgeons guide the beam path. Such systems are mostly available for use in Europe thus far, with FDA approval pending in the US. The regulatory hurdles that any laser system must clear in the US are generally more stringent than in Europe and elsewhere. Nowhere is this more evident than in the realm of low-level laser therapy (LLLT) modalities. Left: Low-level laser therapy (LLLT) has been approved by the FDA in some cases as an adjunct to liposuction because it emulsifies fatty tissues. Right: The LLLT platform Zerona. Courtesy of Erchonia. LLLT likely was born of the idea that pointing a light at an unhealthy part of the body might fix the problem. In the several decades since the concept has been around, LLLT has been used to address hair loss, arthritis, chronic back and neck pain, wound healing and body contouring. The typical amount of power used in these applications is 0.3 to 19 J/cm2 – so low in fact that near-IR LEDs are used as an alternative by some practitioners. There has been a great deal of controversy over the effectiveness of LLLT, with proponents convinced of the health benefits. Unfortunately, there is very little research published thus far showing repeatable positive results. Despite the lack of verifiable efficacy, however, there is a growing market for LLLT products and services, leading to a potential niche to be filled. Erchonia Corp. of McKinney, Texas, is an LLLT specialist that has seen the benefit of clinical trials. “The market is massive, when you consider the desire for noninvasive treatments with no side effects,” said Charlie Shanks, the company’s vice president of sales and marketing. The 15-year-old company has put its LLLT systems, including the EML and Zerona instruments, through trials specifically to gain FDA clearance and give them a competitive edge. The EML has FDA approval for use as an adjunct to liposuction, and the Zerona for general fat removal performed for body contouring. Using several laser diodes emitting at 635 nm, the devices aid the removal of adipose cells from the waist, hips, thighs and other areas by emulsifying the fatty tissues prior to liposuction. In late 2011, Erchonia reported encouraging results from a clinical trial using the Zerona device to reduce the circumference of patients’ arms, and is now also pursuing the use of LLLT to tackle cellulite, female alopecia (hair loss) and foot fungus. Moderately powered femtosecond lasers are used to surgically remove cataracts, tumors and necrotic tissues as well as for cutting into hard tissues, such as teeth and bone. Ho:YAG, CO2, N2, dye-based and other heavy-duty systems typically are used in surgical suites, but diode and fiber lasers are becoming ubiquitous, helping to shrink costs and footprints as well as making it easier for a wider variety of technicians to use the devices rather than just medical professionals. There remain important areas open to improvement with both devices and techniques. For example, soft tissues such as gums, arteries and organ surfaces infused with cancerous tumors typically are under tension. When you carve a straight line or curving path through the tissue with a pulsing laser, there is a very quick mechanical response by the target: The small amount of material directly in the beam path is vaporized, and any remaining tissue recoils from the beam spot. This mechanical relaxation response is uncontrollable and can interfere with the goals of the surgery; for example, healthy tissue undergoing relaxation can inadvertently wander into the beam path and be unnecessarily ablated by the laser. A single cell was removed from a fruit fly epithelium using a novel laser technique in which a single holographically shaped pulse replaced multiple strikes with the beam. The cell to be isolated is marked with an asterisk in the first frame, and the following frames are at 6 and 70 s after ablation. Courtesy of Aroshan K. Jayasinghe, Vanderbilt University. “There is a limit to what can be learned from single-shot ablation,” said M. Shane Hutson, an associate professor of physics at Vanderbilt University in Nashville, Tenn. He added that masking techniques can be used, for example, for excision of individual cells from a tissue section, a useful method for cell biologists in particular. However, using a mask requires a laser with higher fluence (and thus power) than is prudent. To avoid the problems inherent with point-to-point laser cutting, Hutson and his colleagues recently developed a technique that reduces the overall effect of mechanical relaxation. By shaping the beam profile with a holographic pattern, they encircle a tissue excision target and use a single UV laser pulse to complete the cut. The technique vaporizes as many as 30 points simultaneously, and doing so causes less disturbance in the remaining tissue than would burning one point through at a time, even when moving the beam spot rapidly. Progress in cell biology, especially regarding the external and internal forces that act on individual cells, will depend upon advances in laser technology and developing novel applications for them. Hutson’s group at Vanderbilt will use its holographic technique to explore cellular dynamics in embryos in a multitude of model organisms, from zebra fish to fruit flies and more, but there remain many more niches to fill for attentive laser techs. 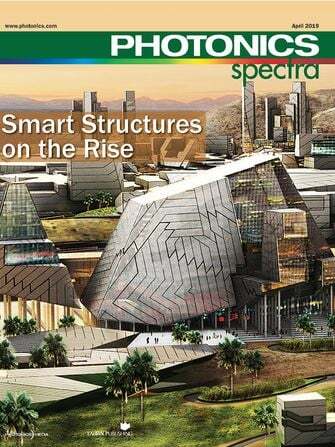 If the global economic malaise continues, look for both academic and commercial enterprises to continue the drive to develop novel ways to use laser technologies and to fill new market niches as they appear. BMW created a stir in September when it announced it was working to incorporate lasers into its automobile headlight systems. Shown briefly at the 2011 Frankfurt Motor Show installed in an i8 concept car, the laser headlights dazzled onlookers. BMW has developed automotive headlights that eschew halogen bulbs and LEDs in favor of diode lasers. Courtesy of BMW. The system uses three blue diode lasers in each of the car’s four headlights. The triangulated beams pass through lenses imbued with yellow phosphors, which change the blue light to white while also diffusing it. The combined white light then reflects off a central mirror and onto the road ahead. 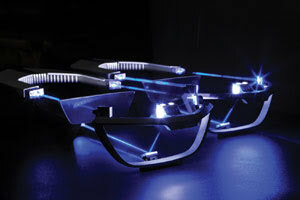 BMW sees lasers as a natural replacement for the LED headlamps that are now becoming increasingly popular. 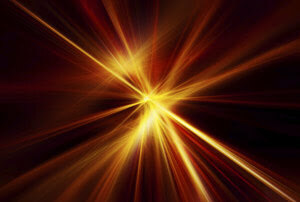 The lasers provide more intense light but require half as much electrical power overall. The laser diodes also take up less space than the comparable LED designs needed today, and should last as long as LEDs. BMW admits that putting its laser headlights into all of its autos is still several years away, but once that happens, expect a robust laser diode market to crop up as other automakers make the switch. 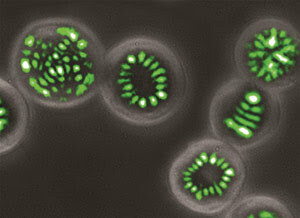 The most surprising new source for lasing power to arrive in 2011 has to be living cells. Researchers at the Wellman Center for Photomedicine in Cambridge, Mass., used green fluorescent protein (GFP) – a natural molecule that provides bioluminescent light for sea-dwellers in the deepest parts of the ocean – as the gain media for their cell-based laser. Lasing cells can be used to provide a light source in photodynamic treatments, such as killing tumor cells. Courtesy of the Wellman Center for Photomedicine. The center’s Seok-Hyun Yun and Malte C. Gather engineered human kidney cells to express GFP, then placed a single such cell into a 20-µm-wide cavity formed by parallel dielectric mirrors. When they pumped the cell with an optical parametric oscillator (OPO), the light emitted by the GFP reflected from the cavity mirrors and began to lase. The cells provide more intense light than cells that simply fluoresce, which means they could ultimately be useful for detecting and monitoring intracellular processes, or even for photonics-based therapies. The resulting beam pulses with only 1 nJ of power, so the cell remains alive after the OPO is shut down. Yun and Gather also have built a prototype microfluidic platform that incorporates the cell-based laser. In this system, individual cells flowing in a narrow channel generate laser light as they pass through a pump zone. If successful, they say, the device will offer a new way to perform cytometry; for example, it could detect subtle changes between normal and cancerous cells that pass through the microfluidic channels based on their biophysical differences. In mid-2011, London-based BAE Systems conducted a successful field test of its Mk 38 MOD 2 Tactical Laser System, one of several systems in development to bring to life a practical laser weapon. 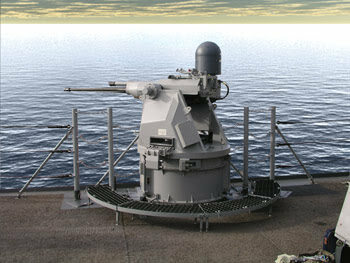 The high-energy system can identify hostile targets, and track and engage enemy vessels within an actionable range. BAE Systems’ Tactical Laser System couples a solid-state high-energy laser weapon module with the existing Mk 38 naval machine gun system. Courtesy of BAE Systems. In the test, the laser system fired against various maritime targets and faced “swarm tests” that simulate an attack by a large number of fast, maneuverable small boats, intermingled with neutral boat traffic. Later in the year, Raytheon Co. of Waltham, Mass., carried out what it called an operational demonstration of its Talon laser-guided rocket, a weapon designed to be launched from Apache Longbow helicopters toward both stationary and mobile targets 1 to 6 km away. The perfect performance of the Talon system in the tests ensured that it will be put into production, both in the US and in the United Arab Emirates. About the time BAE Systems tested its new system in August, it laid off 3000 workers. However, despite continuing threats to the budgets of defense contractors across the globe, look for existing laser-based exploratory programs to continue and for new ones to be envisioned and put into at least the planning stage.